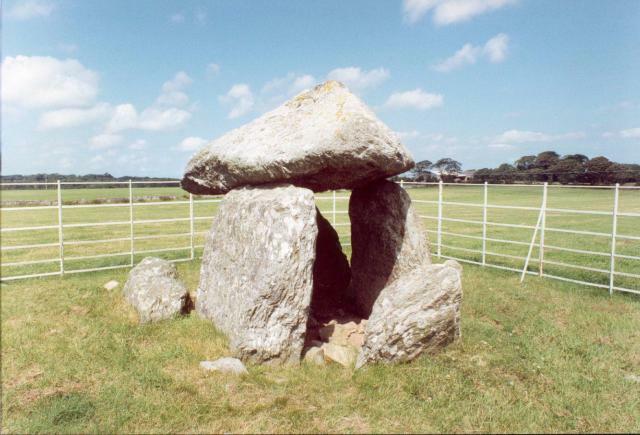 This is thought to have originally been a passage grave with a short entry passage from the east. It would have been covered by earth or turf, which has eroded away leaving just part of the internal stone structure. This mound may have had edging stones and other features none of which can now been seen. Cairns or passage graves of this type were around between 2000BC and 4000 BC. A far as I am aware there is no evidence that links this to a grave, other than its similarity of design, so it could equally well be the remains of some other ancient structure. The remaining stones are a capstone balanced on three uprights. The capstone is 8ft (2.4m) long and 6ft (1.8m) wide, and pyramided shaped. Besides this there are four upright and one fallen stones. This site has not so far been excavated. 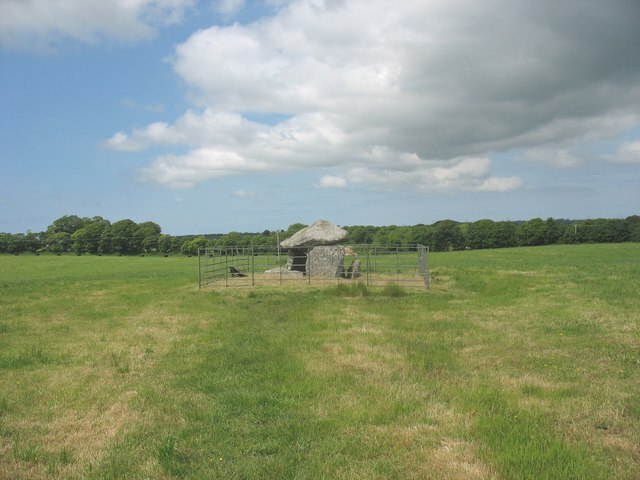 One visitor to this site reported, "This is the gorgeous (and possibly important) view from the 'front' of Bodowyr burial chamber, down the sloping field, and across the Menai Straits towards the noticeable dip in the mountains of North Wales mainland. I would imagine the dip would be the gap between Snowdon (on the right) and Glyder Fawr (left), where the Llanberis Pass runs. Maybe the sun rose in that dip at Midwinter Solstice". This might be worth further research, possibly allowing comparison to Newgrange (Ireland) and other locations labelled as passage tombs where the direction of the entry passages is related to the midwinter sun rising. Now fenced off in the middle of a field with easy access from the road. Getting there: From the A4080 at Brynsiencyn take the minor road to Llangaffo at the next crossroads continue straight over the burial chamber is in field by road, see map for detailed location. Access: Small gate from road, into field.